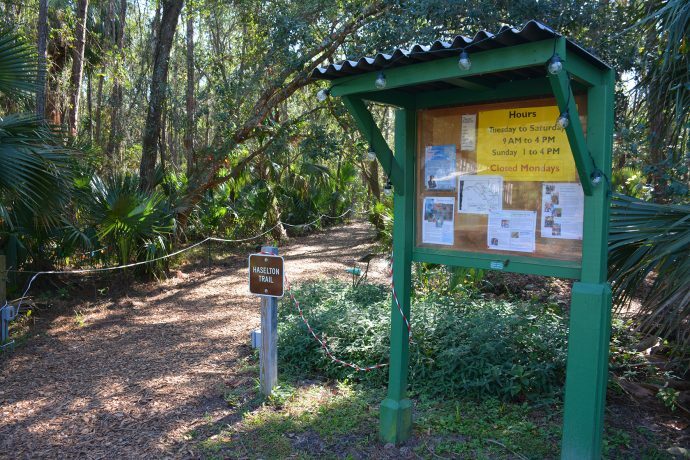 Trout Lake Nature Center | Florida Hikes! 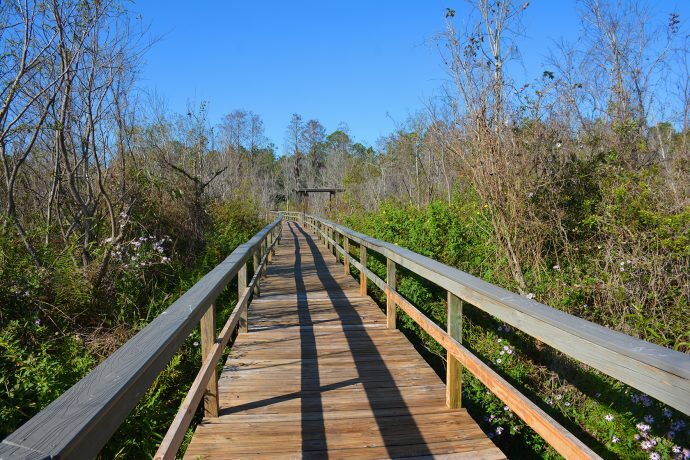 Amid hammocks of ancient oaks and dense floodplain forests along the northern shore of Trout Lake, Trout Lake Nature Center in Eustis offers a network of family-friendly interpretive nature trails that guide you through these habitats out to a long boardwalk into the lake. From the covered pavilion at the end, you can see the cypress-lined shore and its many resident birds. 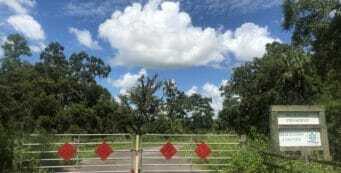 A private nature preserve for public education, the 230-acre complex was founded by the Okalwaha Valley Audubon Society in 1988. Closed Mon and major holidays. Dogs are welcome. Bring your bug spray! Stop in and see the critters at the Charles Newell Hall and Museum before heading out on the trails. The Environmental Education Center has additional exhibits, a library, and restrooms. This is an environmental education facility so it is busy with school groups on weekdays during the school year. Regular evening programs and guided trips to other outdoor sites are offered year-round; check their website for details. From the intersection of US 19 and US 441 where Eustis and Mount Dora meet, drive north through downtown Eustis on US 19. After 3.6 miles, you reach CR 44, not to be confused with SR 44, at an intersection north of downtown with a CVS and Walgreens on the right and Publix and 7-11 on the left. Turn right and continue 0.4 mile to the park entrance on the right at a small sign and gate. The entrance road is narrow and unpaved, but tunnels deeply into a pretty hardwood hammock before reaching the parking loop at the Environmental Education Center. 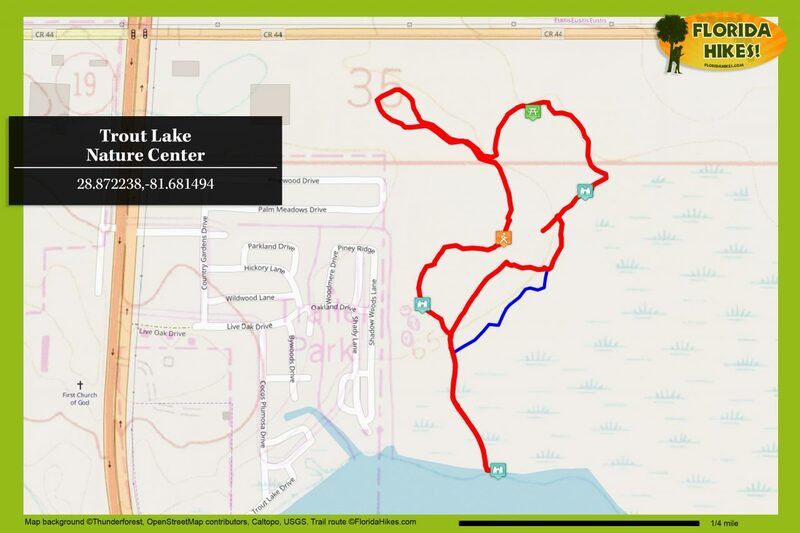 There are many ways to walk the trail network through Trout Lake Nature Center. We started in front of the trailhead kiosk between the Haselton Trail and the Lazy Oak Trail, taking the Lazy Oak Trail to the right. 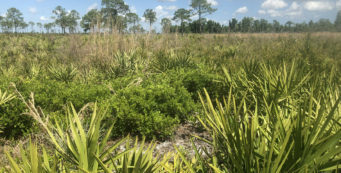 It rambles through a forest of tall skinny oaks with cabbage palms in the understory before turning a sharp corner to meet the narrow Bobcat Boardwalk. This lengthy catwalk leads you over a portion of the forest that can get quite wet at times. Soon after the Bobcat Boardwalk ends, you walk up to an intersection with the Haselton Trail at a kiosk. Turn right and follow the footpath right up to a broad boardwalk. Leaving treeline, the boardwalk heads straight out into the marshy fringe of the shore of Trout Lake and then over open water, ending at the dock and a covered pavilion. This is an excellent spot for birding. 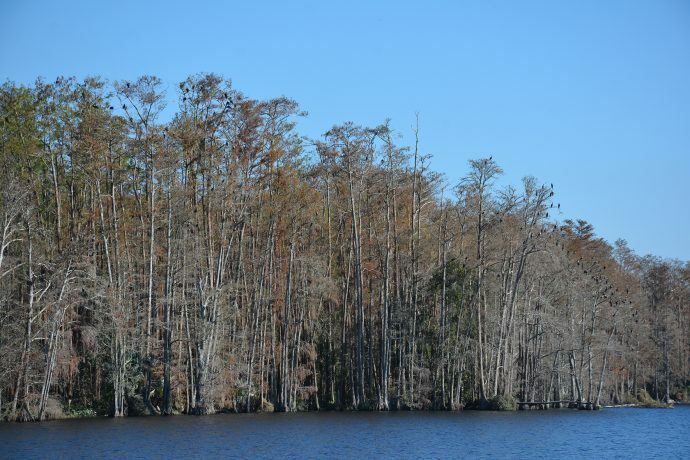 In winter, we saw thousands of cormorants roosting in the cypresses and diving into the lake. Returning back along the boardwalk, turn right when you get to its end. There is a sign warning you that this trail, the Armadillo Trail, can flood. 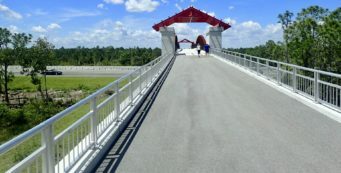 If it is flooded – and it will be obvious right away if it is – continue straight up the Haselton Trail to access the Little Armadillo Trail on the right to bypass the part of the Armadillo Trail that floods. 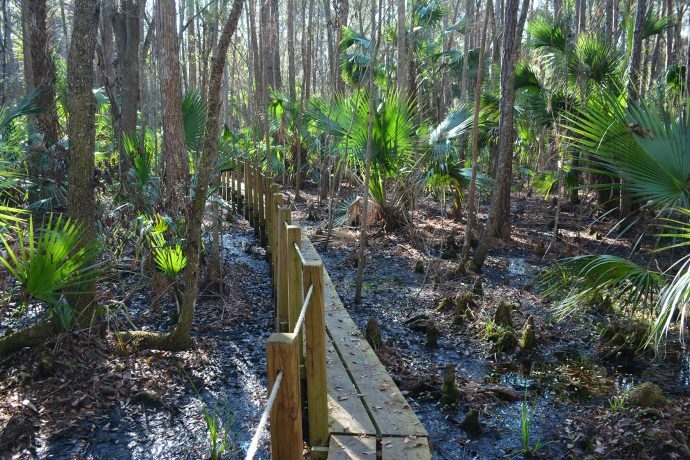 The Armadillo Trail hugs close to the ecotone between hardwood hammock and floodplain forest, with glimpses of cypresses to your right and slash pines to your left. It is very humid here, which helps lichens and bromeliads flourish. Goldfoot fern grows in great sprays from the cabbage palms. Where the Little Armadillo Trail comes in from the left, turn right to continue on the Armadillo Trail. It winds through this lush landscape, passing behind the Environmental Education Center before it comes to a T intersection with a boardwalk. This is the Adventure Trail, which starts next to the Environmental Education Center. Turn right. 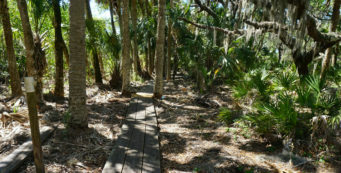 Like the Bobcat Boardwalk, this is a very narrow boardwalk – an old-fashioned catwalk – with a rope on one side. It leads you deeper and deeper into the cypress strand until it finally crosses a creek beneath the cypresses on a bouncy swinging bridge. What fun! The boardwalk continues past the bridge, curving left, until it gets all the way out of the flood zone of the cypress strand. It reaches another T intersection here. At the T, the Adventure Trail makes a right. We tried going in that direction but lost the blazes, since the footpath wasn’t obvious and trees that are marked to be removed due to hurricane damage also have orange marks on them. So take a left at the T to join the Grandfather Oak Trail. 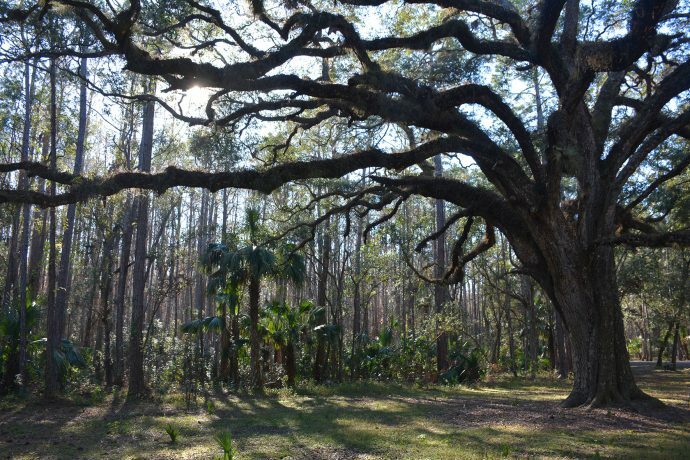 It follows the ecotone between cypress strand and pine flatwoods until it emerges beneath a massive live oak that you saw when driving in to the nature center. There is a picnic bench here, and a small parking area between the oak and the park entrance off SR 44. We also tried to follow the Adventure Trail from the oak towards the park fence, but lost it again. So until it’s marked and cleared by the dedicated volunteers who maintain these trails, that part of the adventure will have to wait. Instead, turn left and start walking up the park entrance road, crossing the culverts over the cypress strand. Look for a trail sign on the right. The Gunkel Trail goes off to the right, so head that way. It leads you under tall slash pines and the understory of cabbage palms beneath them. Take the right at the Y intersection to follow the loop around beneath large live oaks. The trail crosses a utility easement at a diagonal; the second time it crosses the easement, the crossing is more obvious. When you finish the loop, follow the trail back out to the park road and turn right. You end up right in front of the Charles Newell Hall and Museum within a couple of minutes, and back to the main trailhead.